To quote Blair Waldorf, "Oh...My...F-in...God!" Yes, the sophomore season of 'Gossip Girl' is THAT good! I would love to spill...but spoilers give me hives, plus many UK friends loiter here so I owe it to them not to be loose-lipped (their season two start isn't until January 2009, poor things). I *can* say that Chuck Bass out performs episode after episode -- you should see the latest Blair-busting trick that's sneakily tucked up his spiffy sleeve. For her part, Blair is at the top of her game -- an easy victim, think again! And the others? Well, Nate's a well-coiffed mess, Serena & Dan are all hormones and Jenny is...just where *is* little J? That leaves us with poor Vanessa - like her character, her story-lines are at the bottom of the bargain bin, poor girl. All in all, a very VERY tangled Upper East Side web. 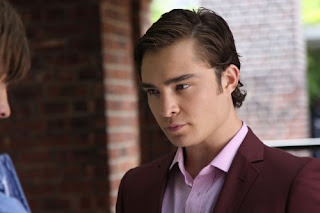 Which brings us full circle back to Chuck - the Bass brat runs the proceedings here, and in doing so, 'Gossip Girl' is in very entertaining hands. 90210 can only aspire to be so tasty and fulfilling. Spill, spill, spill. I don't mind you giving the game away. Pleeeease, I can't wait till January!! So not fair. I'm gonna throw a strop soon. I miss my rich, snobby, fabulous friends!! Think I'm going to cry into my The OC boxset.